Labor Day is over and as far as I'm concerned, it's officially fall. 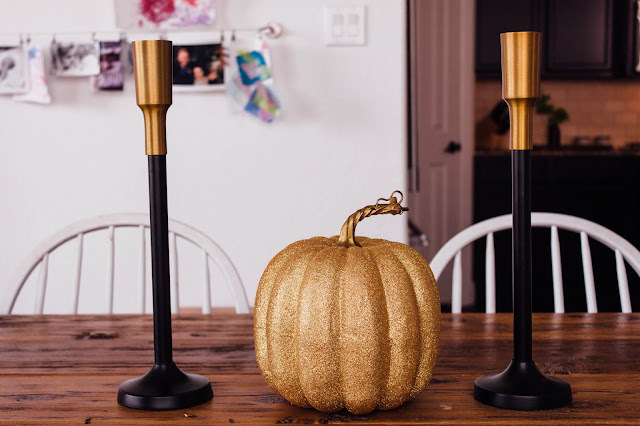 Bring on the pumpkin everything. Having said that, I'm sure it comes as no surprise that I've started adding that cozy touch of fall to our house. Personally, I'm not a fan of a lot of fall decorations. Sometimes less is best. I know, I know, I love pumpkins as much as you, but I don't need them all over my house and I certainly don't need scarecrows everywhere. Because let's be real, I don't want to have to dust that nonsense. 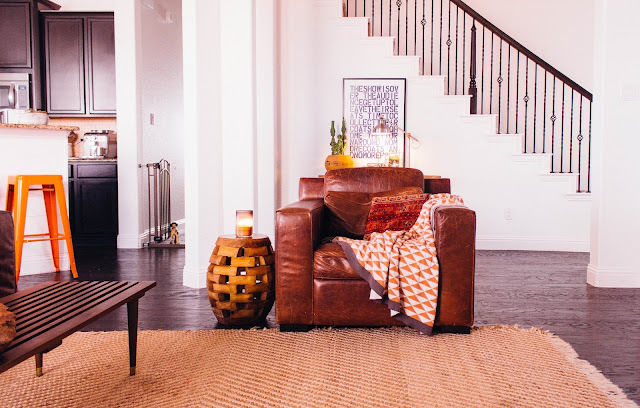 So today, I'm sharing how I achieve that cozy, fall vibe without adding clutter. 1. Texture, texture, texture. Did you get that? Texture is key. 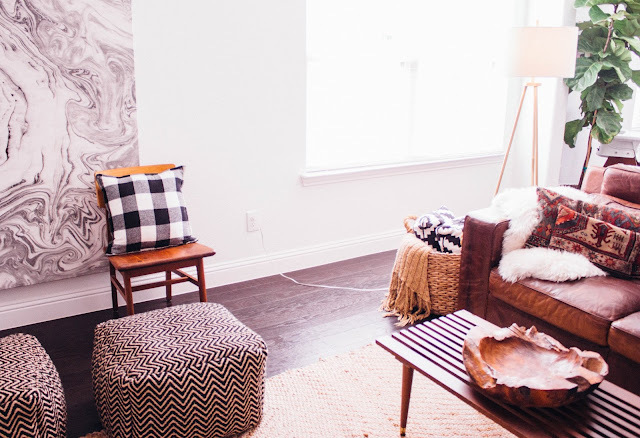 I love adding chunky baskets, cozy blankets and warm patterns to the space. 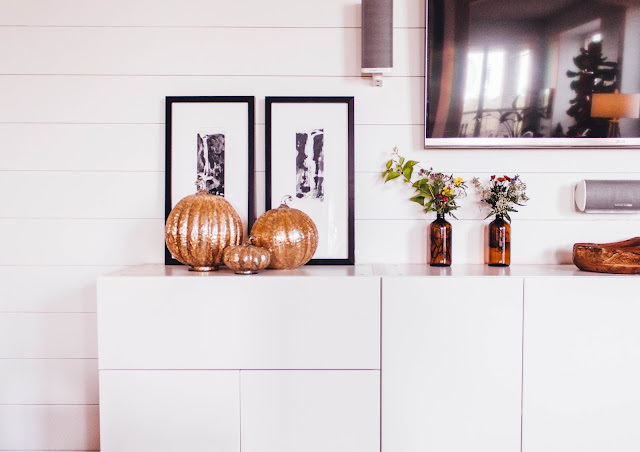 It really warms a room up and gives it that cool weather, fall vibe that I just love. 2. Bring the outdoors in. 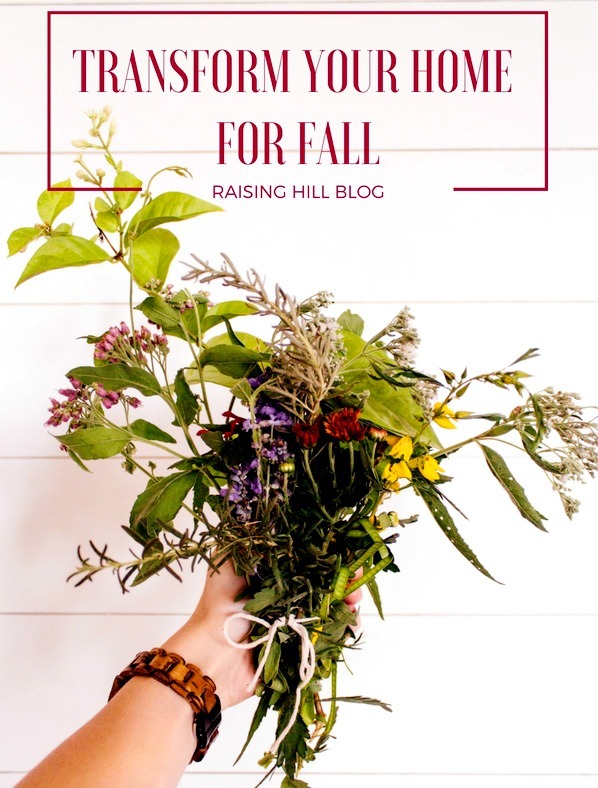 Because what says fall more than fresh flowers and dried twigs? I picked up a bag of delicious potpourri at Hobby Lobby and added it with some glittery pumpkins (I love the glitzy touch) but it was still missing something. So I added some branches from the tree in our front yard that didn't survive the Texas summer. I wasn't planning on adding any flowers, but I found the most gorgeous blooms on my walk at a local nature trail, I couldn't resist picking some and adding them to some amber glasses. I'm swooning over how great they look! 4. Metallics are your friend. Adding touches of gold and bronze really adds that fall look we all love. Do this and you're golden. see what I did there? And there ya have it, a cozy, fall look that doesn't sacrifice style! 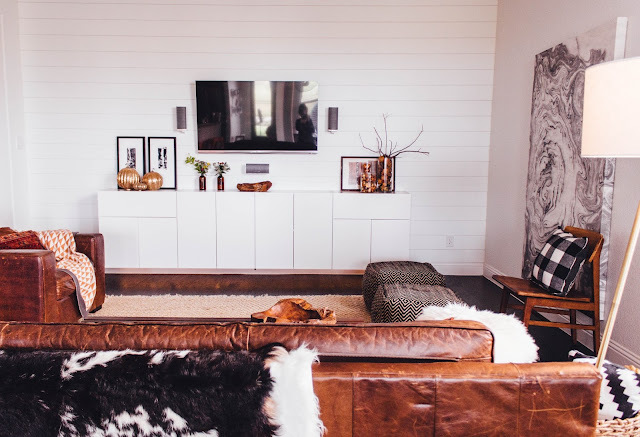 What are your fall must haves for a cozy home? Loving all the splashes of orange! 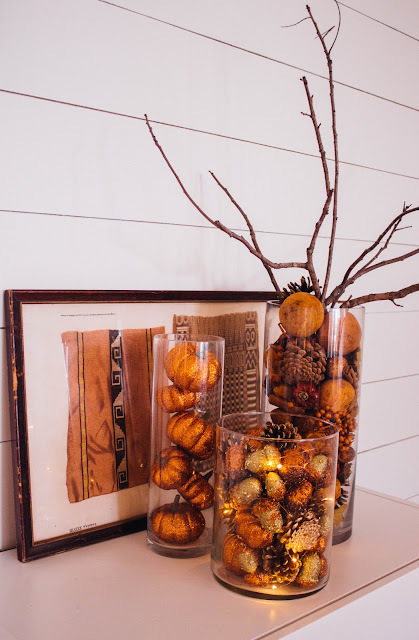 I really like to bring the twigs and pinecones in for fall too, plus they're an easy transition to winter. I'm with ya, bring on everything pumpkin - let's go! Thank you! Can't go wrong with pinecones! I am trying to hold off for another week, but you are not making it easy. I love all of the orange and the pumpkins too. I wish it were just a bit cooler here. But I may not be able to wait for the weather to cooperate. :) Very pretty home. I get it. I live in Texas and while I'm ready for fall, it certainly doesn't feel like it. Your house looks great. Looking forward to being able to decorate once the toddlers don't destroy everything. Thank you! Pine cones really are the best. You remind me of one of my best friends. Her FAVORITE season is fall. We are minimalist, you don't have many decorative items in our house, but your photos are beautiful. I can't get over how lovely your decor is. Your house looks beautiful. I love all the orange. It's one of my favorite colors too. I definitely agree that less is more. Great tips! I love the gold and bronze idea! I may have to do that! These are great tips! I especially love the tip to add metallics. Your home looks beautiful! I've gradually been pulling mine out. I love to decorate for Fall. We don't get a "fall" where I live in Australia. I mean we get autumn, spring etc of course but its just not the same as the way some other countries experience it, beautiful. I love these tips! Especially the texture. I'm so excited for fall!